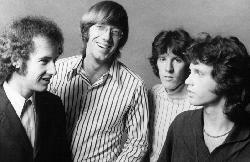 They pushed the boundaries musically, socially and politically and while Jim Morrison rightly deserves athe lion's share of the credit for making the Doors one of the most influential bands of their era, Ray Manzarek's keyboard work had a lot to do with what made the band stand out musically. On so many of the band's songs, Ray's work on the keys accounted for a lot of what made the Doors recognizable musically before Morrison even sang a note. Ray Manzarek passed away Monday (5/20) at a treatment facility in Rosenheim, Germany. The keyboard player was 74. He sat last December with Ben Fong Torres to discuss the release of the Doors Hollywood Bowl concert and the legacy of the band.